Don’t let the rainy weather get to you! Come in and join us by warming up with our delicious Mexican food. 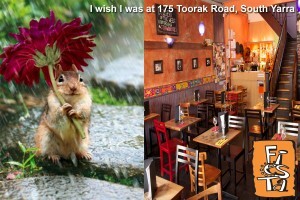 We have the right amount of spice to get your taste buds going again with Melbourne’s unpredictable weather. Our tacos, enchiladas and quesadillas are all oven baked with delicious, melted cheese and hotness ready for you to take a bite to keep you warm.